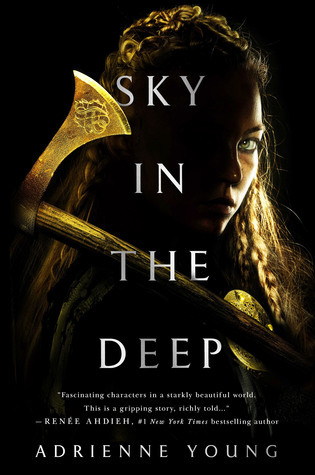 Review: Sky in the Deep is one of those books that has been hyped up in the YA book community, so naturally, some people are skeptical wondering if it’ll actually live up that hype. I’m here to tell you IT DOES. Adrienne Young is an exceptional story teller. She quickly pulls you into Eelyn’s brutal world. But Eelyn isn’t just a heartless brutal warrior, she has family she cares about and she begins questioning everything she’s ever known. Her character development is just incredible to watch. I really loved the different relationships throughout the story as well. Between Eelyn and her father, Eelyn and her best friend, Eelyn and her brother. The love the people in the book have for their family and fellow clan members is something we don’t always get to see in YA fantasy and it was refreshing and wonderful. This was a fun adventure from start to finish and if you are even remotely interested, definitely pick this one up! Thank you so much to NetGalley and St. Martin’s Press for sending me a copy to review!